After /u/brw316 and /u/Spiffyster pointed out some inconsistencies with the listed Resilience levels (which doesn't surprise me, seeing as I just measured pixels to get them way back in Vanilla D2) I went in-game to figure out what the levels were, or at least get as close as possible. 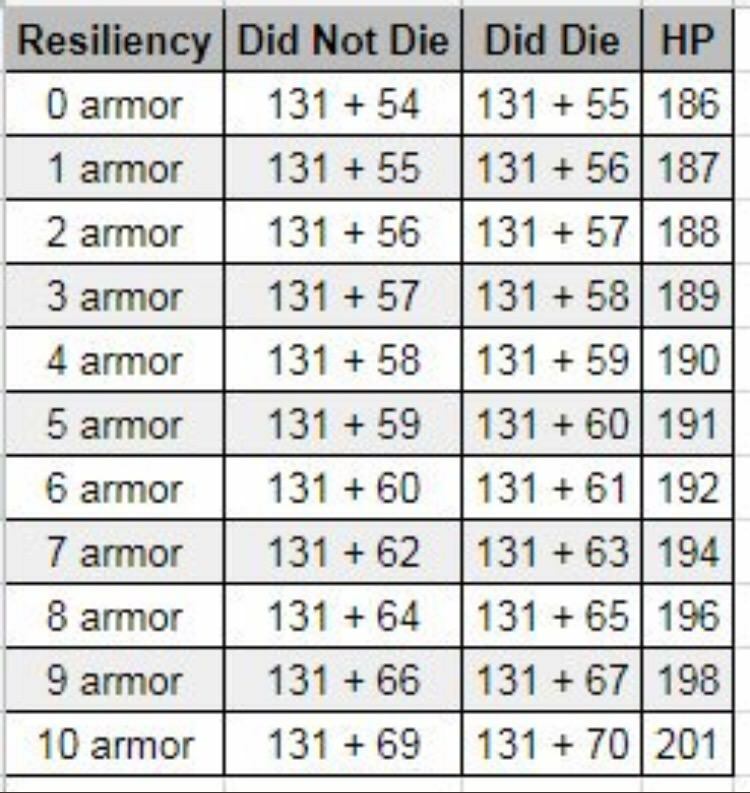 Seems the base and peak HP values are the same, 186 and 201, but HP increases by 1 with each additional Resiliency level up to 6, then it increaese by 2 for each level up to 9, then it increases by 3 for 10. I'll be updating the spreadsheet with the new values ASAP, and probably changing the way standard TtK is displayed as well. Please still consider that these are rounded values, and there is a good chance some of the actual HP values are slightly lower than displayed. Well, it means that High-Impact Scouts just got a whole lot better! Along with any weapon that was being held back by killing more slowly against 7 armor or higher Guardians. There is still a lot of testing to be done, but I'll keep updating the sheet and trying to nail down the most accurate numbers possible!